We never send anything out without a verbal confirmation of exactly where, when an how to ship your package, so, you don’t ever have to worry about unexpected packages when you are out of town! Our preferred shipping vendor is FedEx, although we will be happy to send your package with whichever method is most convenient for you. Shipping charges are not included in the price of the dress and will be billed separately. If for any reason you are not satisfied with your purchase, we will be happy to exchange your unused gown within 7 days of your purchase. Design to Shine cannot exchange any gown that has been worn or is not in its original condition. Please note, we do not offer refunds on any purchase. Buyer agrees to these terms & conditions upon deposit on purchase. Warranty & Remedy Seller expressly disclaims any implied warranties of merchantability or fitness for a particular purpose. Seller expressly notifies buyer that sales personnel lack the requisite power to make any express warranties. Further, Seller makes no express warranties. Seller expressly limits any potential Buyer’s remedy to repair or replacement of the garment only upon a termination by Seller that garment failed in the absence of Buyer’s mishandling, misuse of damage. Seller expressly disclaims any other remedies including those for economic, non-economic or consequential damages. SELLER’S RETURN POLICY IS EXPRESSLY LIMITED TO UNUSED, UNWORN, UNDAMAGED GARMENTS WITHIN 7 (SEVEN) DAYS OF PURCHASE ONLY FOR STORE CREDIT; SELLER NEVER OFFERS REFUNDS FOR ANY PURCHASE, FOR ANY REASON. ALL STORE CREDITS MUST BE USED WITH 90 (NINETY) DAYS OF THE CREDIT BEING ISSUED. Payment in full is required to obtain garment possession. A Minimum 50% deposit is required to hold any garment until payment in full has been made. A minimum 50% deposit is required before any alterations, adjustments, or custom orders will begin production. Payment in full is required before any garment is delivered to buyer. Payment plans must be clearly indicated on the receipt. All garment are sold FOB Seller. Buyer may pick up garments in person or arrange to have them delivered. Seller will verbally confirm with Buyer delivery address, mode of delivery, and timing of delivery. Shipping charges are not included in the price of the dress and must be paid prior to shipment. Custom garment orders generally require between 4 (four) and 8 (eight) weeks to complete. Seller does not guarantee the availability of rush production. However, in limited cases, rush production and delivery within 15 business days will be subject to an additional fee of $ 1,000.00 per garment. A 50% deposit is required to receive a customized sketch and/or fabric samples.Garment production will begin after approval of the sketch and fabric samples, and after we receive the buyer’s measurements. Following approval, alterations or additions to the initial design are subject to additional charges must be paid at the time of alteration or addition. Alterations will incur additional charges. 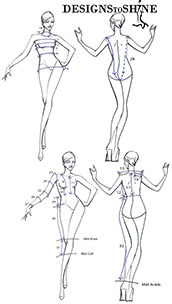 A minimum 50% deposit based on the garment’s price is required before any alterations to a buyer’s garment will begin. Seller will provide buyer with as accurate an estimate as reasonable possible for alterations charges. Seller will notify buyer if this estimate during the actual alterations. However, Seller reserves the right to change alterations estimates. While we recognize and appreciate that beauty is in the eye of the beholder, we pledge to do our best to ensure that every one on our garments fits each buyer as best as possible.